Do you ever have car battery problems? Whether they keep going flat or are simply too expensive to replace, simply using a CTEK battery charger as often as possible will ensure your battery last between 2-3 times longer. Even if you are only concerned about the environment, CTEK have developed the world's smartest battery charger and by using a CTEK as often as possible you ensure that your battery life is increased, easily doubled. This investment will save you time and money in the long run and best of all it makes sure that your car, 4x4, bike, quad, jetski and/or plane is able to start first time, everytime. Perhaps consider ordering one with your exhaust order. Remember our payoff line, "Real sports cars are heard before they are seen!" can only happen if your car starts, especially those not used every day. Product information: CTEK SWEDEN AB develops and manufactures battery chargers for all types of lead-acid batteries for both private and professional use. CTEK's unparalleled innovation has enabled it to develop cutting-edge technology with several patented functions and properties that make CTEK battery chargers and accessories unique. 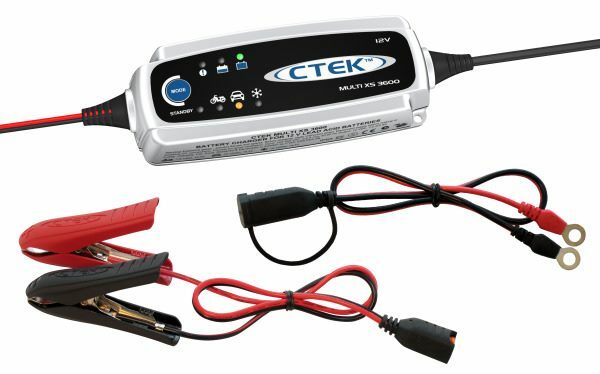 CTEK offers the market high-quality, reliable chargers and accessories that are effective, user friendly and, most importantly, safe (for the user, the vehicle electronics, the battery and the charger). About 400 million lead-acid batteries are manufactured around the world each year; each one requiring charging. If each battery receives proper care and charging, the battery life is significantly extended (about 2-3 times longer than a battery that does not receive regular care and charging). CTEK provides battery chargers to a number of the world’s leading automobile manufacturers. e.g. Alfa Romeo, Arctic Cat, Audi, Bentley, BMW, Corvette, Ferrari, Lamborghini, Lexus, Maserati, Maybach, Mercedes, Rolls-Royce, Scania, Yamaha and Harley Davidson have also decided to use CTEK battery chargers with their own trademark. As vehicle technology continues to develop, increasing strain in being placed on the battery and as a result, Battery Charging has become an essential part of car maintenance and should be considered as important as checking tyre pressures and oil levels. To avoid battery failure, paying for unnecessary call-out charges and/or more expensively, replacement batteries; as is often reported as the number one cause for breakdowns around the world; start using a CTEK Charger to maintain the quality and durability of your various vehicle's batteries from vintage cars, daily runners, 4x4s, bikes, quads, jetskis and/or even aeroplanes. Perfect for fleet managed, delivery and emergency type vehicles too.